As developing markets continue to embrace tech innovation – connected homes, contactless bank cards, and wearable devices – mobile payments and wallets have taken the lead among non-cash transactions in China and are growing their market share across all regions. In fact, consumers globally are expected to make around 725.9 billion transactions using non-cash modes by 2020, of which 603.5 billion are expected to come from retail payment transactions. 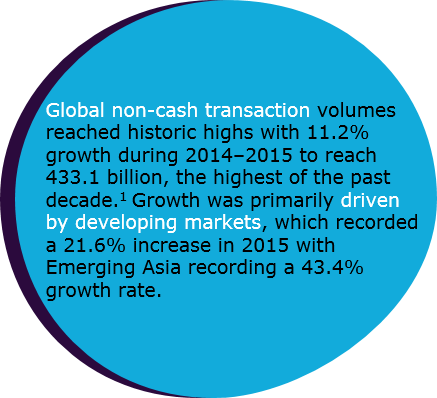 The rise in adoption of digital payment services across all market segments is pushing up non-cash payment volumes. The proliferation of mobile payments and digital innovation is expected to spur high growth across all regions, with adoption differences shaping local trends. Financial inclusion measures from developing economies, such as National Payments Corporation of India’s Unified Payments Interface, are likely to drive growth in non-cash transactions as mobile and other forms of digital payments are deployed. Developing economies are steadily venturing into the digital world by leapfrogging to new technologies while expanding their payments infrastructures. The Internet of Things (IoT) is expected to transform the payments market landscape as more and more devices are connected. In mature markets, a combination of near field communication (NFC), contactless technology, and mobile payments are fueling growth. As contactless payments become more routine, the trend is picking up steam, by 2022 more than half of global POS transactions (53%) are expected to be contactless, compared to just 15% in 2017. The total number of contactless transactions (combining card, mobile and wearable transactions) is expected to increase at a CAGR of 38%, to reach 170 billion by 2022. In the EU, mobile wallet transactions are anticipated to grow at a compound annual growth rate of 61.8% from 2016–2021. Mobile payments in the United States are projected to grow at an 80% CAGR from 2015 to 2020, to reach $503 billion from $100 billion in 2016. Thanks to the IoT, 15-billion machine-to-machine (M2M) and consumer electronic devices will be connected by 2021. Widespread connectivity is spurring consumer expectation that IoT should play a role at every touch point within the customer journey. With a technical foundation in place, and as demand swells, the timing appears right for an Internet of Payments (IoP) that makes payments on behalf of customers. IoP-enabled devices today include basic Amazon Dash Buttons (for product reorders) as well as sophisticated washing machines that order detergent when running low or refrigerators that place food restock requests. Payment innovation, driven by consumer demand, is being brought to market by both banks and non-bank institutions. While banks are developing apps to provide enhanced digital experience to customers, they are also partnering with FinTechs to deliver the best value to their customers. BNP Paribas and Swedish FinTech Tink have partnered to futher enhance BNP Paribas’ mobile banking application. New payments players such as FinTech startups, telecom companies, and technology firms are entering the segment with user-friendly wallet apps and features like instant payments. WeChat and Alipay, which already have a stronghold in China, are looking to expand into new markets. In 2016, China’s mobile payments hit US $5.5 trillion, roughly 50 times the size of America’s US $112 billion market. Digital payments would not happen without users’ trust. Seven out of the 35 regulatory initiatives in place in payments across the globe aim at protecting consumers of all type of risks and ensuring they remain trustworthy. Most customers continue to trust banks to conduct payment transactions as they perceive them to me more secure than FinTechs or TPPs. According to the World FinTech Report2017, incumbent financial brands earned an overall trust rating that was 13 percentage points higher than that of FinTechs, and in fraud protection, FinTechs lagged by 30%. This trust factor could be a boon to traditional banks as they consider implementing new solutions. Based on trust, customers are bound to adopt new bank products more readily than those from new players. Also, advantageous to incumbents is their established payments infrastructure, which gives them the upper hand over new players in the industry. Other ways to deliver convenience to customers is for banks to leverage near field communication, QR Code, or Bluetooth to provide easy-to-use payment interfaces. The next-generation payments market is thriving; and that means unlimited opportunities for banks to develop integrated solutions such as e-wallets with built-in security elements while building a robust, modular platform for a secure digital payments ecosystem. Now, more than ever, traditional banks must evaluate their place within the payments ecosystem and be open to partnering with FinTechs and third-party developers to drive value collaboratively. Some banks have already started building new relationships in this regard – for example, BNP Paribas introduced WeChat Pay to retailers in France in 2017 and is planning to launch it subsequently across Europe. According to The World Bank, financial inclusion means that individuals and businesses have access to useful and affordable financial products and services that meet their needs – transactions, payments, savings, credit, and insurance – delivered in a responsible and sustainable way. Ensuring that people worldwide have access to a transaction account is the focus of the World Bank Group’s Universal Financial Access 2020 initiative. Unified Payments Interface (UPI) is an instant real-time payment system that facilitates inter-bank transactions. The interface is regulated by the Reserve Bank of India and works by instantly transferring funds between two bank accounts on a mobile platform. Examples of near field communication (NFC) are Samsung Pay, Apple Pay, Android Pay, Fitbit Pay, or any bank mobile application that supports contactless payments. Juniper Research website, https://www.juniperresearch.com/press/press-releases/contactless-account-more-than-1-in-2-pos-trans, Accessed March 2018. Nfcworld website, https://www.nfcworld.com/2016/04/11/343906/mobile-wallet-transactions-increase-61-2021/, Accessed March 2018. BusinessInsider website, http://www.businessinsider.com/nearly-half-of-millennials-have-used-a-mobile-wallet-2016-9?IR=T, Accessed March 2018. Ericsson website, https://www.ericsson.com/assets/local/news/2016/03/ericsson-mobility-report-nov-2015.pdf, Accessed March 2018. IBS intelligence website, https://ibsintelligence.com/ibs-journal/ibs-news/bnp-paribas-signs-up-tinks-financial-management-tech-into-mobile-app/, Accessed March 2018. NYTimes website, https://www.nytimes.com/2017/07/16/business/china-cash-smartphone-payments.html, Accessed March 2018. “BNP Paribas launches WeChat Pay in Europe,” https://www.finextra.com/newsarticle/31310/bnp-paribas-launches-wechat-pay-in-europe, Accessed March 2018.